I just saw your video, thats deffnitley coming from the amp picking up magnetic or eltromatic radiation from transfomer. I saw that ground switch makes a diffrence, thats a big hint most of the time this means you have done a poor ground wiering scheme and its causing the hum. If you have ground switch off and theres no humm, that means you have poor ground wiering. And its not picking up noise from transfomer. If your case is grounded to mains and then you connect ground to b+ negative using case thats a majour source of humm , I always found this to be massive issue. A possible quick and dirty solution is to directly put parallel ground wires to mains ground from diffrent ciritcal ground points in system. Because the wires are in parallel directly to mains ground this will not become a ground loop and cause noise. You really want to have ground from mains connected somewhere over here, if it was connected at power supply section then theres long wire seperating ground to mains and resistance. This means the amp ground has noise voltage introduced from currents in ground. Looking at your photo a bit more you have implied that you grounded somehere near filter caps thats very bad having long wires before amp ground can meet mains ground, lots of noise. Have you found your component/wiring error yet? The ground switch completely separate the chassis/mains ground from the signal ground. When the ground is "lifted", the preamp takes its signal ground through the output cables to the power amp. The preamp mains ground and signal ground are then completely separated. The noise is present with the switch in that position, and there’s JUST noise when the switch connects both grounds together. I haven’t actually found anything yet, but I have done some modifications to the left side of the buffer circuit. I rechecked all components values for the left channel of the buffer, and everything was correct. I just rearranged the components in a different manner in hope of getting rid of the noise. I am not shure if it was actually the case, but pins 4 and 5 might have not been connected together correctly. I made shure they are soldered as they should. Could have this caused the kind of issue I was experiencing ? Could have this caused the kind of issue I was experiencing ? If one half of the buffer tube was not heating, then that stage would simply act as a cold rectifier in the circuit. This would explain the clipping you were seeing on the buffer stage. Again, the buffer (when operating correctly) can handle very large voltage swings (i.e. >100VAC) without clipping or distorting. When you said one channel was clipping I suspected a wiring or component problem, but lack of heater would also case the problem in one channel. But, what I would describe as a low level hum is still audible with the volume down to 0. Totally listenable in my opinion, but still, there is room for improvement. BUT, I think I messed up from the begining. I checked the 4S with the scope tonight and the clipping I saw two days ago wasn't there anymore. I decided to try the 4s on my system, just to realize that the same f****** noise was still there. I was unplugging it to bring it back on the table to do further testing, but decided to plug it back and try the ground lift switch. We talked about it so why not. Bye bye 120hz switching noise. And I think I missed that from the start !!! At the very least I should have try this before. Still, I might have more than one problem. The scope dont lie, the curve is now way cleaner than it was before. It works better with both grounds connected together. Am I missing something or it's supposed to be the opposite ? Also, there's only noise on one channel when ground lifted. Does that means there's still something wrong, and it's ground related since the ground lift switch ''solves it'' ? The grounds at the input are connected to gether via rca cable to music source, so your amp must also have L and R ground connected togethere somewhere. With still little humm left try unpluging all music signals from amp and compare to that with pre amp plugged in at 0 volume. Correct grounding means pre amp connected there should be same humm or even less. It could be ground wiereing on amp or pre amp or poor contact with power plug that connect from mains to amp. Old power plugs tend to have some corrosion and you can't get very low resistance to the ground pin on the wall. Moving the plug arround gentally may help regain contact. If the amp has noise only on oneside when ground is lifted then that means something is not done quite right, either picking up noise from transfomer or poor grounding. But if the ground swith fix it thats also fine. Not the best but is acceptable by all means, neglectable small gains from doing it absolutley right. Keeping the Amp and Pre AMP power cord connected just next to each other is a good way to help minize humm or solve it. Having pre amp connect at another side of the mains or through a long cable increases ground resistance and may cause hum. Should the input and output sockets ground connected together ? Each and every grounds in my preamp are connected together through a bus bar. Only the mains/chassis ground is not connected to the bus bar, when the ground lift switch opens the circuit between chassis and signal grounds. my understanding is that this grounding scheme acts the same way as star grounding, but without having cables that runs everywhere. Btw, the power amp alone is dead silent. It’s a yamaha m-50 in perfect condition. Connecting input and output sockets ground together and adding a direct ground to mains ground in between may help reduce noise. Then you would have a second ground wire direcctly to mains, directly to ground of amp ground. If the amp is large and Left Right ground spaced far away from each other you will need to directly ground both Left and Right to mains. You really want to have the ground star return point somewhere overhere as in picture, then you will have one wire that connects to the ground of b+ supply on other side of pre amp. Also you need a cap here of 1uF or larger somewhere from Pre AMP B+ to Ground. Without 1uF and the wire length the power supply is not quite a short circuit, signals may appear on b+ and maybe negeltible sound quality reduction. Also I've noticed your not using coax cables for input and output, that will make you pick up noise, you need to atleast twist your signal or output signal to its ground to make twisted pair to help reduce noise. From exprience even twisted pairs pick up some noise is best to use coax. Is your pot connected directly at outputs, if pot connected at input that means at 0volume the power amp input is not shorted to ground and some noise is normall. Also if you connect your pot wrong way arround then the pre amp is short circuit and the power amp input is not short circuit to ground at 0 volume which will cause noise. So it seems like the pot is connect at inputs, this means with some small noise at 0 volume its normall. 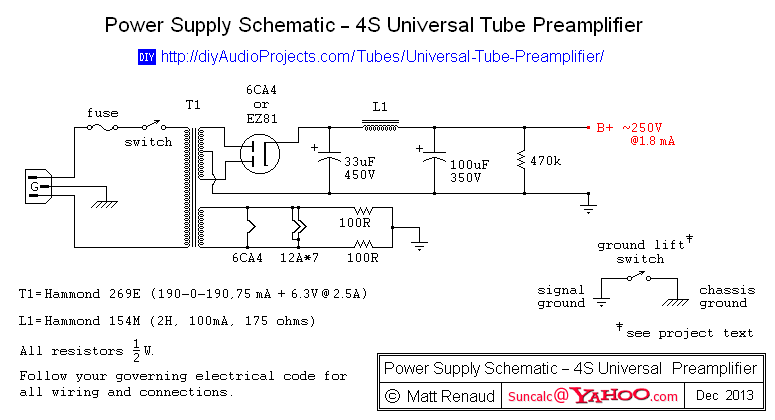 I’m not shure if I understand exactly what you meant, but here is the link for the power supply schematic and I have uploaded the shematic for the amp and buffer sections.